Note: This is NOT a romance, it's a Vampire Fantasy read. 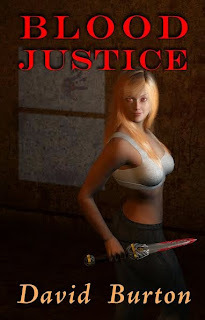 David Burton's "Blood Justice" is the first book in a Vampire Fantasy series. It's a fascinating read. It has an ensemble cast. The good guys are all good gals! Like Buffy The Vampire Slayer but with three adult female Vampires working together to avenge the murders of their loved ones. A couple of interesting plot twists. At times, there was almost too much going on - almost - it was a heady read. Can't wait to check out the next book, "Blood on the Water."